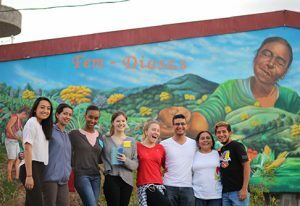 Students and community partners in Esteli, Nicaragua in front of Las Diosas, a social, organic and fair trade enterprise. IAP is one of our favorite times of year at D-Lab because we are able to send so many students abroad. This year, 41 students traveled to 10 different countries to work with collaborators from many areas of D-Lab’s global network. They mostly lived in the communities where they were working, often living with host families, to experience life as it is lived by our collaborators. Here is a roundup of the many and varied projects our students participated in during IAP. Botswana: The team worked with local organization These Hands, advancing projects ranging from an ostrich egg driller (for making jewelry) to a human-powered washing machine. Colombia: Through local innovation center C-Innova, students worked on a rainwater harvesting system, as well as a coffee selection machine and arduino setup to control the temperature curve inside a coffee roasting machine. Guatemala: These students examined cook stoves and cooking practices in the town of Santa Catarina, together with local organization Link4. India and Nepal: In India, the team worked on a xylem filter water research project funded by J-WAFS and an agriculture project; in Nepal, students assisted with a heating project in the Himalayan region. Kenya: The group provided technical support to two Nairboi startups, BrightGreen Renewable Energy and Foondi Workshops. Uganda: Working with a local educators, students helped lead a youth STEM workshop in Soroti, in collaboration with Makerere University and TEWDI Uganda. Ghana: Students ran a workshop to identify wastepickers’ financial needs and aspirations, in order to identify appropriate financial inclusion tools for the informal sector. Nicaragua: The team led workshops with a cooperative of 400 smallholder women farmers to understand technologies and business models appropriate for responding to climate change. Ethiopia: Students participated in the Transform WASH Co-Design Summit in Awasa, in partnership with Population Services International.